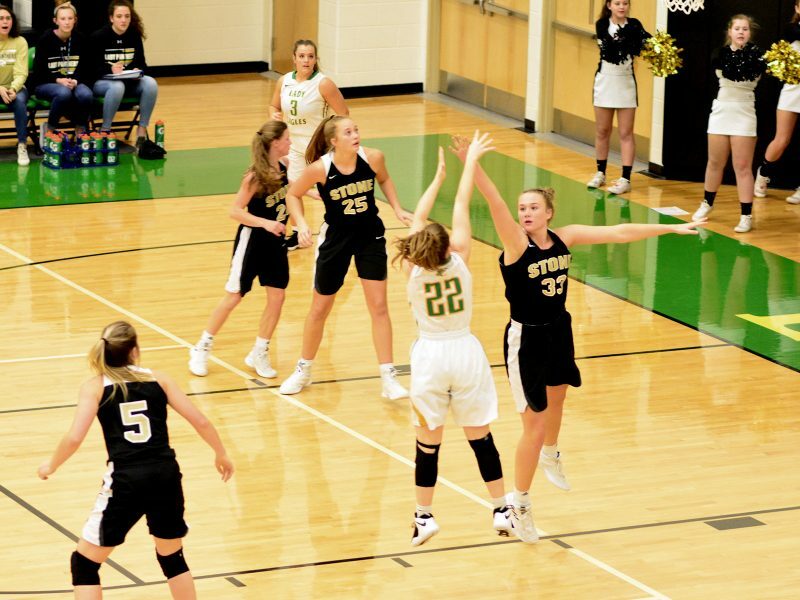 Evensville, TN — Rhea County Eagles and Lady Eagles each dropped a close home game to Stone Memorial on Friday. With a lucky bounce or two of the ball Rhea County could have come away with the sweep. The Lady Eagles opened the night against a very good Stone Memorial team that came into game with only three losses on season. Emma Capps gave Lady Panters early 2-0 lead. Lady Eagles responded with back to back threes by Mallory Hampton and Macy Welch countering Millers three points to take 6-5 lead. A late Welch three put Eagles up 13-12 at first quarter break. After early Hampton basket, the Lady Panthers responded with six straight points to take 18-15 lead. Haley Cameron scored three free throws to pull Rhea even 18-18 before Capps basket. Hampton then hit a three and a two point basket to put Eagles up and then Capps had two baskets sandwiched around Maddie Taylor three to help Lady Eagles to halftime 26-24 lead. Lady Panthers began third quarter with 15-0 run to take 39-26 lead before a pair of three point baskets(Taylor and Welch) and two free throws by Hampton put Lady Eagles down 39-34 with 3:35 left in third quarter. A few seconds later it was Taylor with another three to cut the Lady Panther lead to 39-37 with 2:58 left in third. After a Miller basket, it was another pair of three point baskets, these by Hampton and Smith to close the third for Eagles as both team stood at 41 after three quarters of play. At the 6:41 mark of final quarter it was Lady Panthers with 47-44 lead after Emily Boyd basket. With 5:26 left in game, Maddie Smith canned two freebies to cut lead to 47-46. Lady Eagles then took lead 48-47 on Hampton basket. After a nice pick down low by teammate, Alex Eldridge drained top of key long shot for three points and 50-48 lead with 3:36 left in game. Macy Welch answered with an elbow three on next possession for 51-50 lead for Lady Eagles with 3;10 left on clock. Mattie Buck got loose for each basket for Stone but Macy Welch split two Lady Panther defenders for the go ahead basket(53-52) with 2:47 left. Hampton followed with a drive of her own as she dove to basket and Maddie Smith hit the streaking Hampton for the basket and Lady Eagles owned 55-53 lead. A Miller free throw cut lead to 55-54 with under a minute remaining. Miller the scored down low after nice lob from Eldrige to take 56-55 lead with 21 seconds., That would be final score and Stone had stole away the win from the Lady Eagles. Mallory Hampton totaled 23 points(3 treys) to lead the Lady Eagles and Macy Welch joined her in double figures with 14 points(4 treys). Finishing out the scoring were Maddie Taylor 9(3 treys), Maddie Smith 5(1 trey), Hale Cameron 3, and Skylar Jenkins 1. Lady Eagles won long range battle with 11 threes to the three for Lady Panthers. Tessa Miller, Mattie Boyd and Emma Capps scored 14, 11 and 10 points respectively to lead the Lady Panthers. Alex Eldridge tallied 9 and Emily Boyd added 5 points. Rhea County boys also battled hard before losing 40-36 to Stone in low scoring game. Brett Newcome and Justin Hedrick combined for four opening quarter threes and all 14 points for Panthers as they took 14-11 lead at end of one quarter. Guthrie, Taylor and Laws led the scoring for Eagles with 4, 3 and 3 points respectively. Eagles dialed up defense in second quarter, holding Panthers to 2 points as they took 20-16 lead at halftime. Stone played same game with an 11-4 advantage int he third quarter to setup a winner take all fourth quarter as Stone enjoyed 27-24 lead thanks to last second basket and free throw by Panthers. In the first four minutes of the fourth quarter, Stone pushed lead to 35-28 thanks to three points baskets by VanWinkle and Hedrick. Ricky Guthrie turned a turnover into basket, Drake Taylor hit from long range and Guthrie hit s jumper to cut the lead to 37-35 with 13 seconds remaining in the game. Stone hit one free throw to take 38-35 lea and Eagles still had chance. Dylan Palermino was fouled on the way to basket and ball almost went in. This left Eagles in bad way as with .5 on the clock after hitting first free throw they went for intentional miss. Ball hit backboard and rim before falling into Stone hands, but lane violation had been called. Eagles were forced to foul and both free throws made put the game out of reach at 40-36. Ricky Guthrie led way with 10 points and Kaleb Laws and Dylan Palermino each tallied 9 points to lead the scoring. Also scoring for Eagles were: Drake Taylor 6, Hunter Hill 3 and jackson Harveston 2. Brett Necome and Justin Hedrick with 20(5 treys) and Justin Hedrick 2(2 treys) lead the Panters offense. Jared VanWinkle and Jack Eldridge with 6 and 4 points finished out scoring for Stone. Eagles and Lady Eagles split with Cookeville. Earlier in the week Rhea County entertained Cookeville in their opening district game. Eagles won 61-45 behind Mallory Hampton who scored 28 points without a two point basket. she hit three long range shots and the rest were from the free throw line. She hit 13 of 14 free throws in the fourth quarter and 19 of 20 overall on the night. Macy Welch hit for 11 points with three long range makes. Haley Cameron with 9 points and two treys, Maddie Smith with 4 points(1 trey) and Maddie Taylor 6 points on two treys finished out the scoring. Eleven threes on the night for the Lady Eagles. Eagles lost 69-42 to Cookeville with Ricky Guthrie and Kaleb Laws leading Eagles with 10 points each. Drake Taylor finished with 8 points. Kade Vincent had 3 points, Levi Stumbo 5 points, Jacob Allen 2 points and Cade Cook 1 point for Eagles. Lady Eagles won over Hixson on Monday 49-16 as they came away with 21 steals and Eagles won 53-47.